Created 1977 for 1978 calendar. Scenes like this are initially created in a sketch, and then Greg and Tim would spends hours upon hours looking for the right photographic reference to combine for their painting, and bring their sketch to life. All posing was done in the studio using friends of the two artists, and it was always a blast! 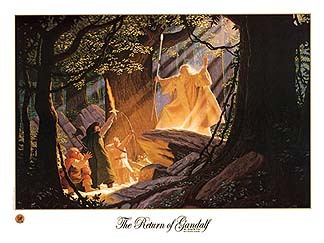 In the Lord of the Rings books, the lighting had not been clearly described, so Greg and Tim added the rays of light shining behind Gandalf as a way to convey the sense of his return from death. This was the first appearance of Gandalf the White, and they wanted to make it epic and memorable, especially because Gandalf was Greg's favorite character. Signed by Greg and Tim Hildebrandt!! !